My walking has picked up a lot recently. 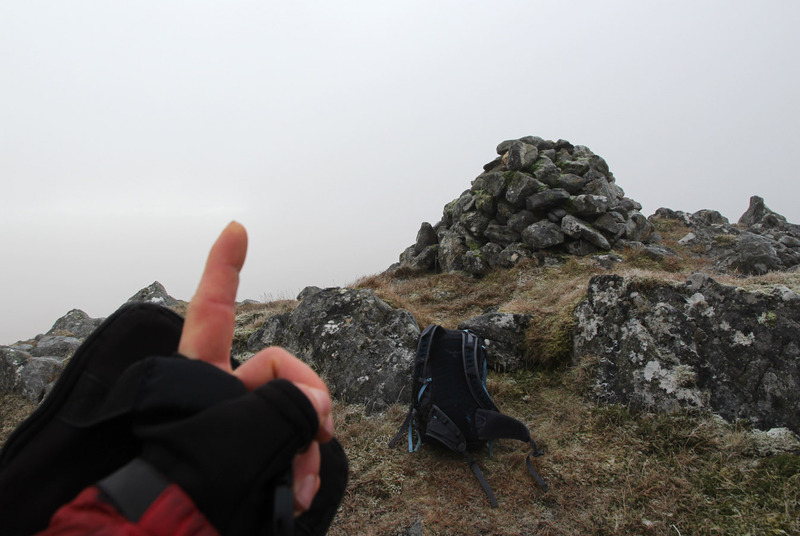 I've not quite nailed the climb in the Arisaig Cave yet, when last session I fell off the top of Triangulation and landed with my thumb and palm on a rock. 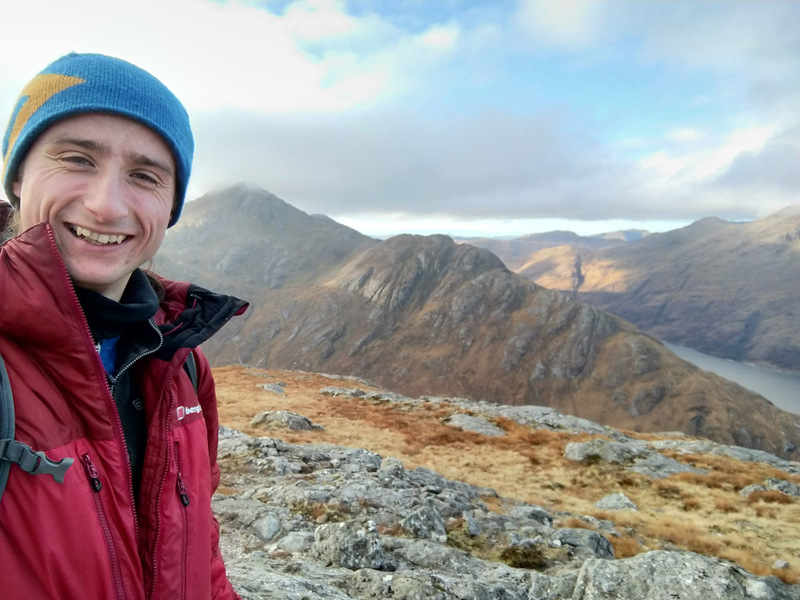 That precluded any more climbing, but it's also a bit of an excuse, as I wanted a bit of change from the climbing - it was feeling like diminishing returns. 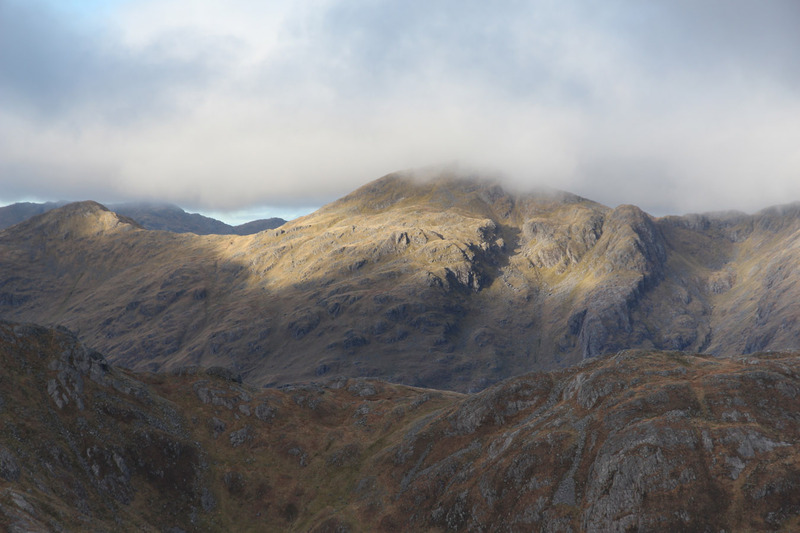 I'll return shortly as the high winds return tomorrow, which are favourable for climbing in. 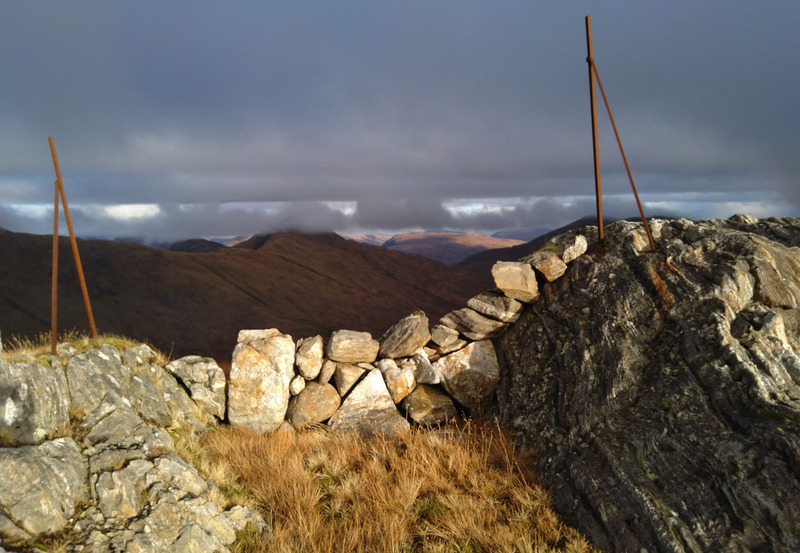 I've been all over Ardgour during the past few days, and it's been great. 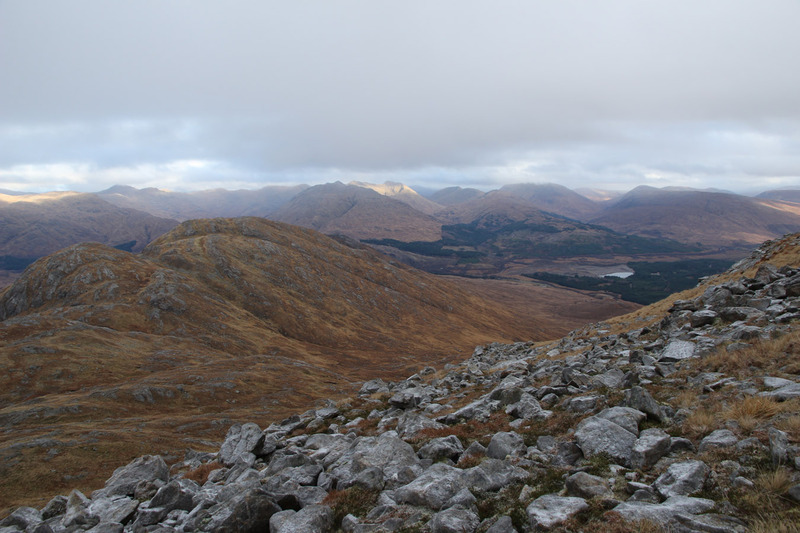 On the first day I had felt out of sorts as I climbed Druim na Sgriodain. 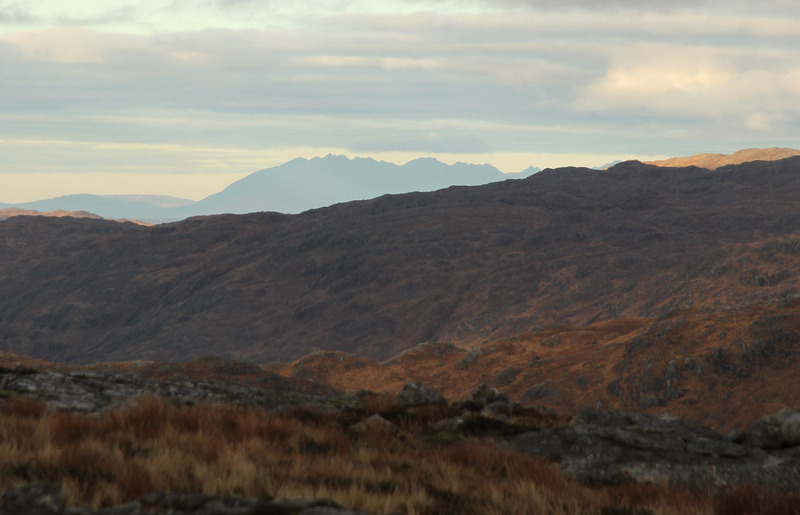 The following day on Garbh Bheinn felt much more sociable with Fi and Scoob. 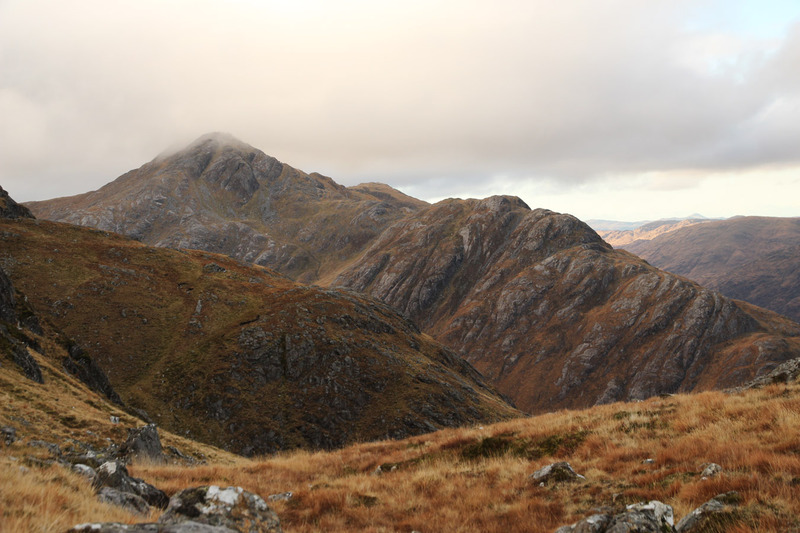 Yesterday, I did a few hours on Stob Coire a' Chearcaill and this build up in walking over several days set me up well for a bigger hill round. Enter the Callop round. The original route inspiration came from Petestack, and gave me good mileage on hard ground. It was nice to be back out like this again and to feel the feet moving. The morning wasn't the quickest start, and I took a long time to get going. I felt a bit rough, took time with breakfast, got packed and got food organised. I could also feel this dark stab of wanting to stay in the warmth, not leave the comfort. I knew I couldn't. It is interesting this warmth isn't felt on normal lazy days around the house; it's there only when presented with a hard alternative. Stepping outside in the darkness, it didn't seem quite as cold as forecast, and the skies were cloudier than expected. 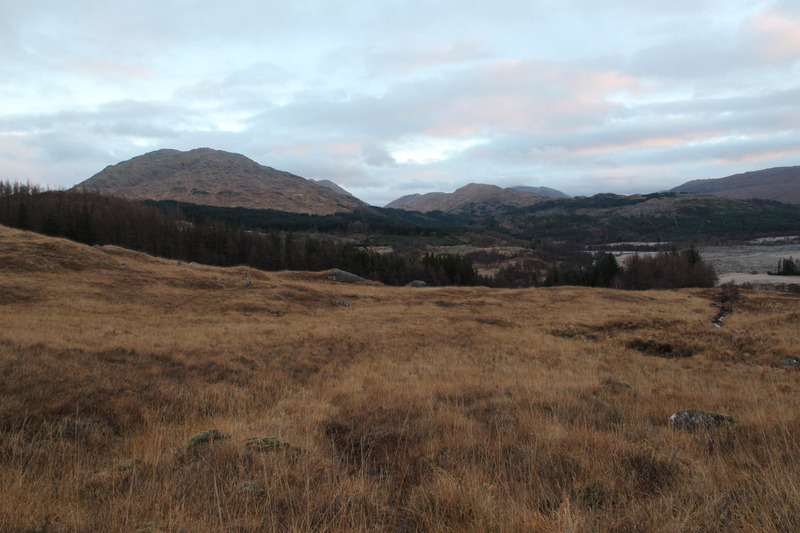 A grey and flat dawn rose as I drove by Loch Eil. 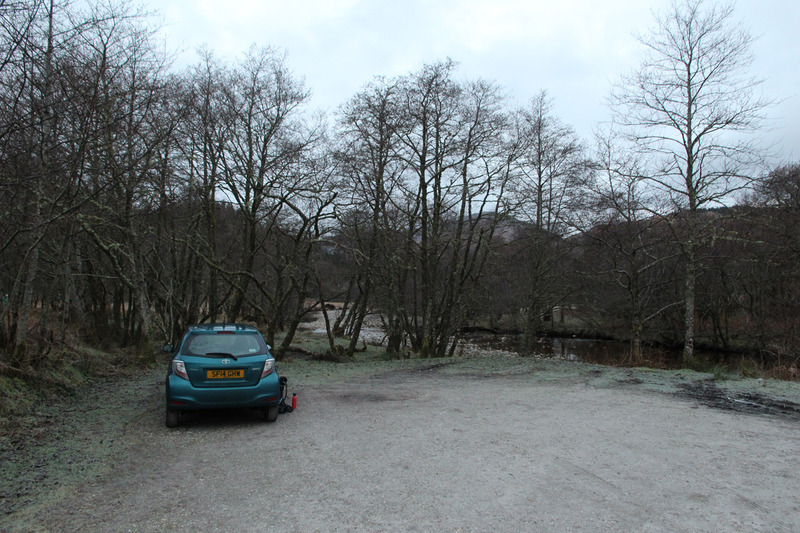 I parked up at Callop, had some quick shut eye in the front seat. I changed clothes, got my bag and started walking. At first, I moved slowly by intention. I didn't really know how far I would go today. 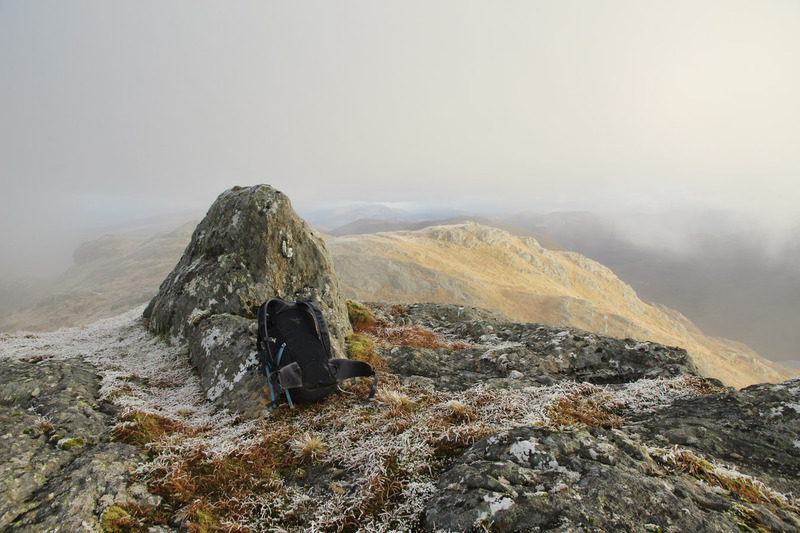 I went direct up the moors to Meall na h-Airigh, the first top on this range. These hills are full of ups and downs. I was feeling so tired that I paid careful attention to my physical state, my temperature. This would all have benefits later. 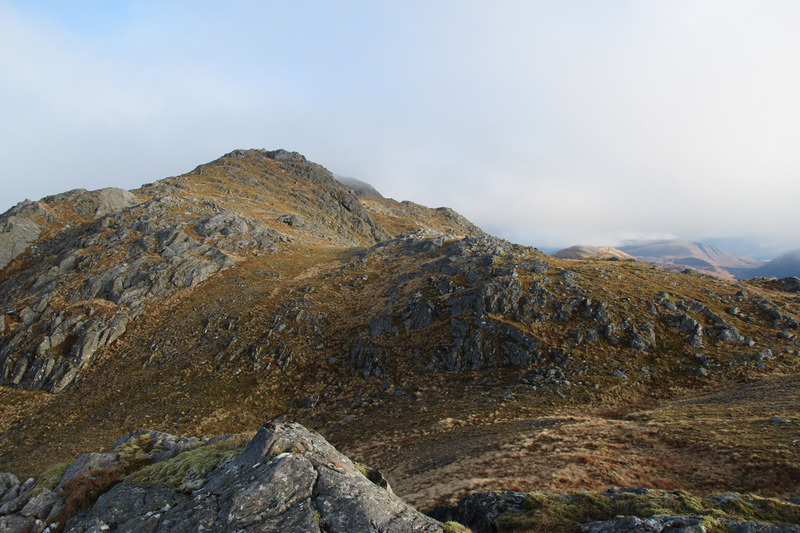 Meall a' Bhainne is the first big summit: straight up one side, over the top and a long way down the other! It's deceptive. 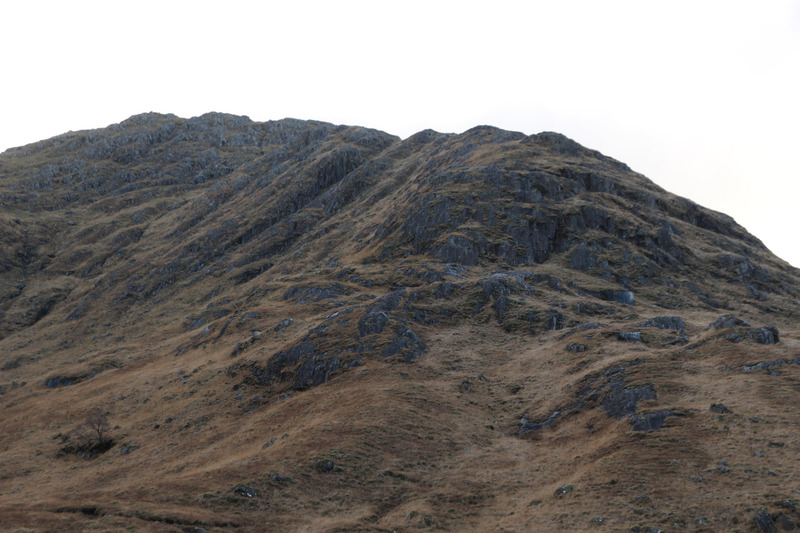 Then I followed a massive right-slanting flake up Sgurr nan Cearc, breaching the steep slopes to find easier ground to the summit cairn. Here, a couple things changed: the ground ahead looked open and inviting. 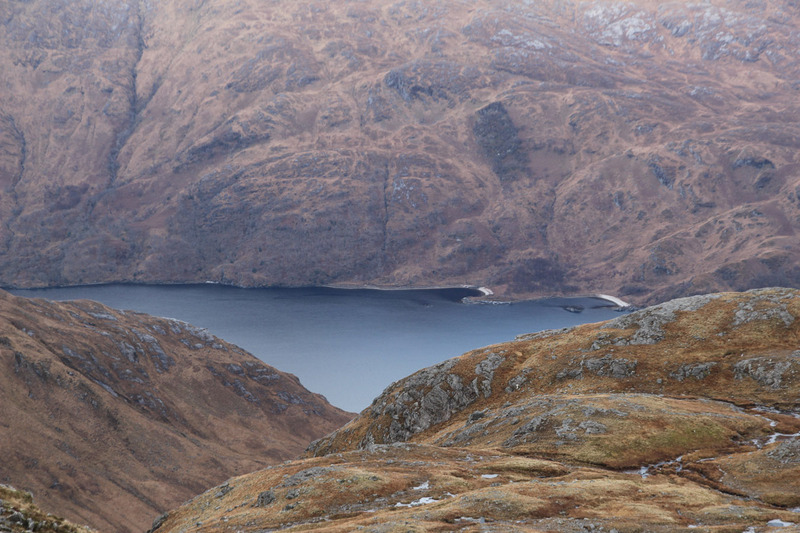 It didn't look too 'hard' in the way that this part of the world is infamous for. And my physical state began to pick up. I stayed attentive of myself. 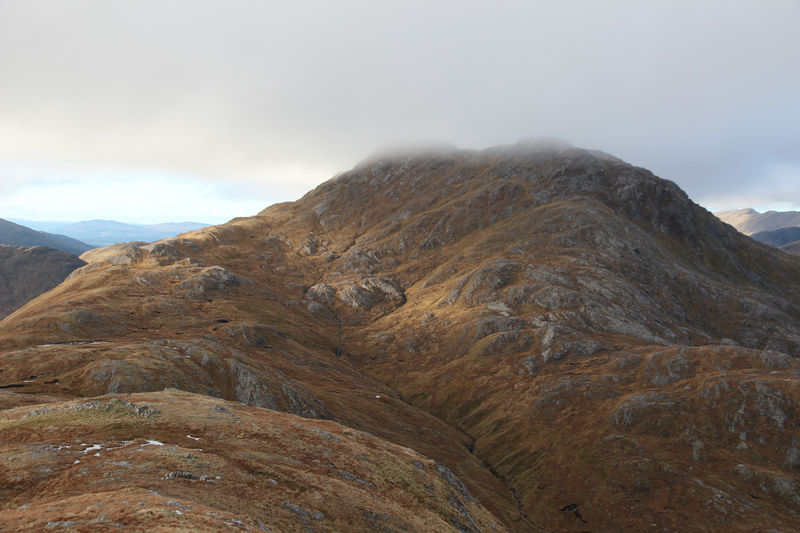 Meall Doire na Mnatha was a quick formality and I was then on my way to the first Corbett of the day; Sgurr Craobh a' Chaorainn. I began to digest the uphills in a steady and careful manner. It didn't seem long to the top of this hill, which was lightly capped in cloud; something that would be the case for most of the day. 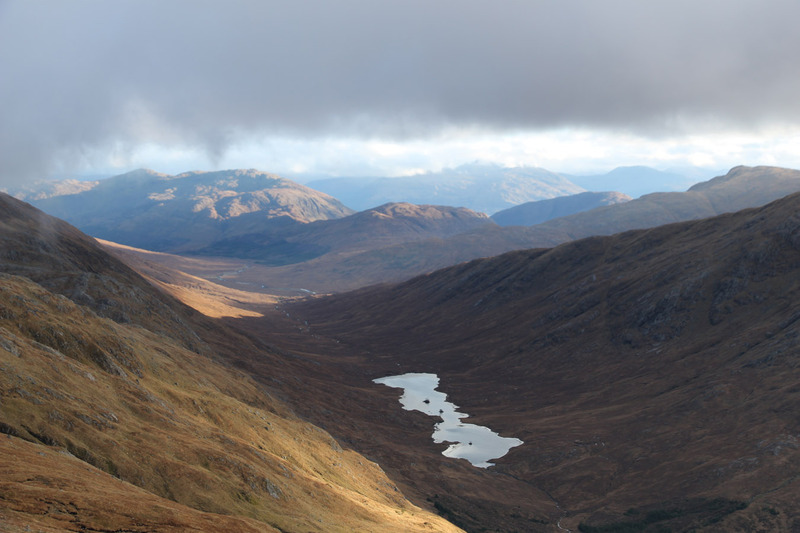 The sun was up properly now too, turning the glens golden and making the lochans and bog shimmer. 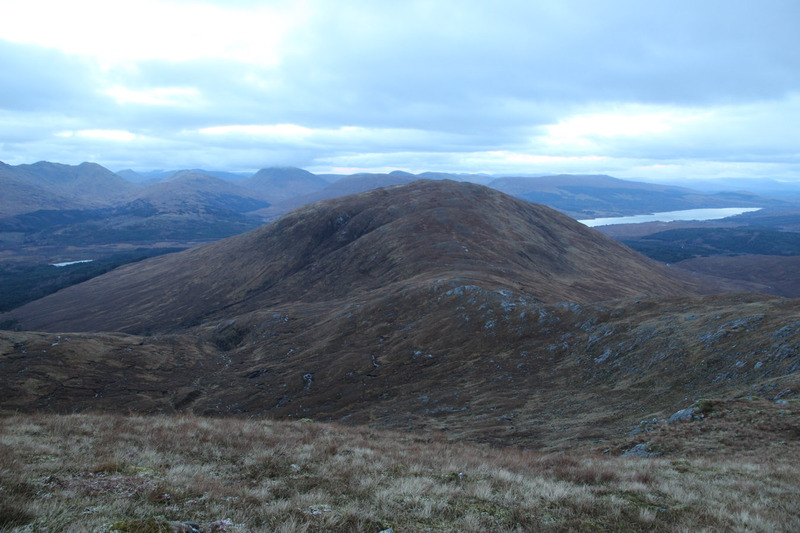 I continued to the big hill of the day, Sgurr Ghiubhsachain. 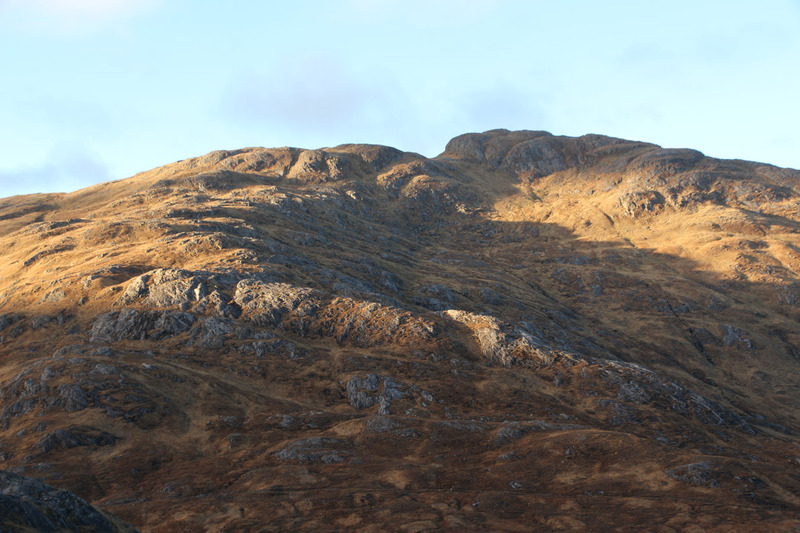 This hill is one of the greats of the area. 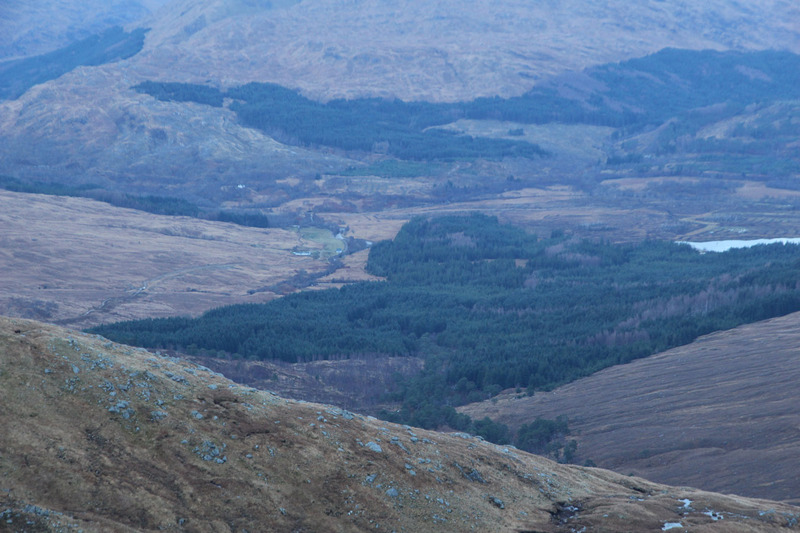 It's famous for being the backdrop to the Glenfinnan Monument - it is thus appropriately well-photographed. 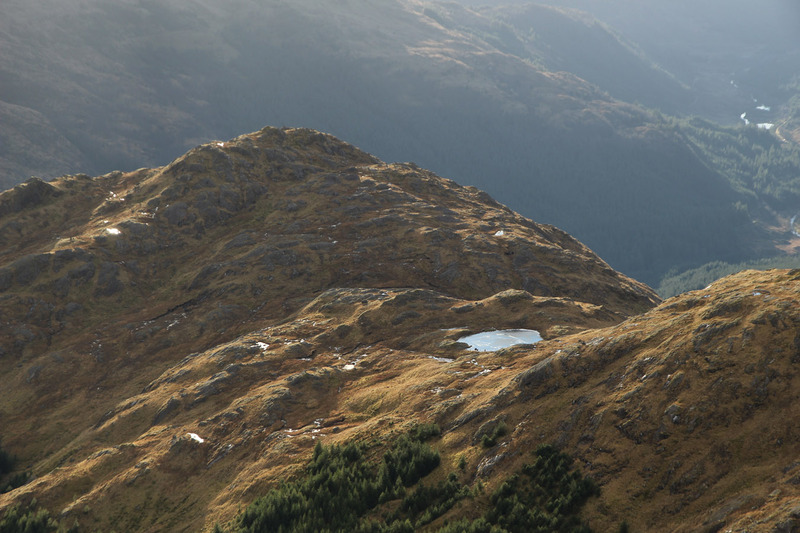 It's a real monster, a mountain typically rough of the area but without the butch shapelessness so common. 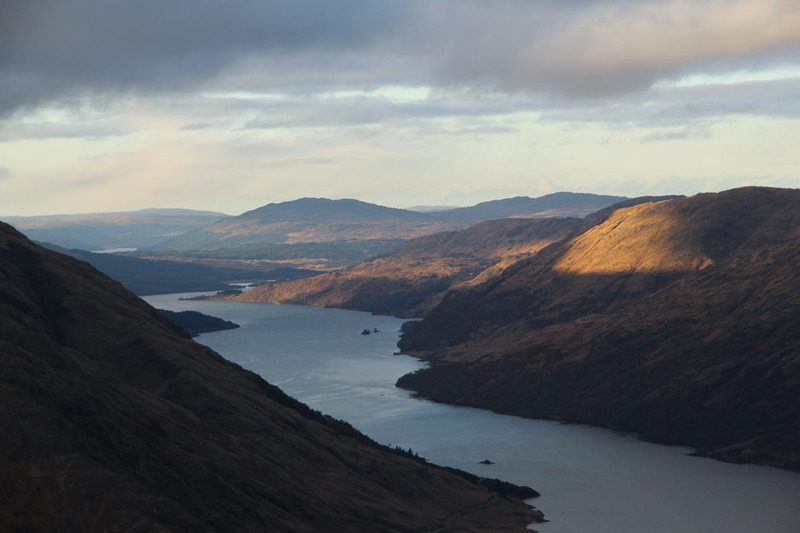 Instead it's arms are long and slender, sweeping nearly three thousand feet down to Loch Shiel. 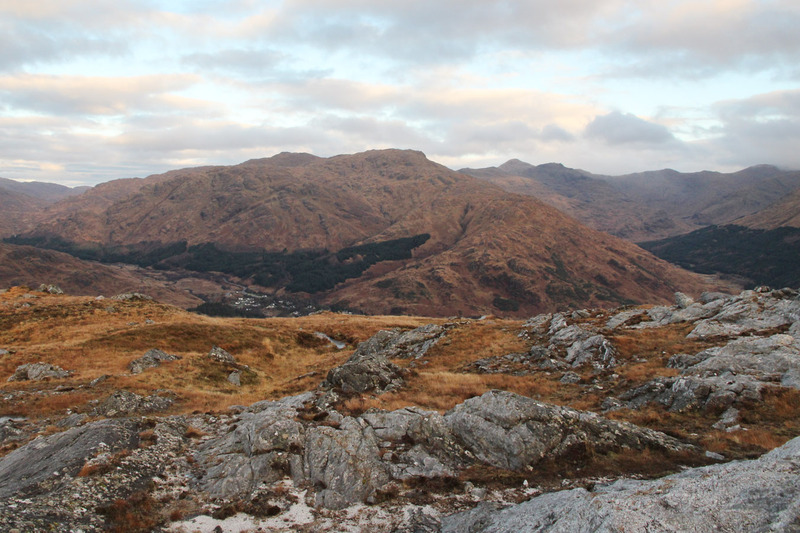 I went up it's eastern slopes, which only give modest indication of the mountain's overall architecture. 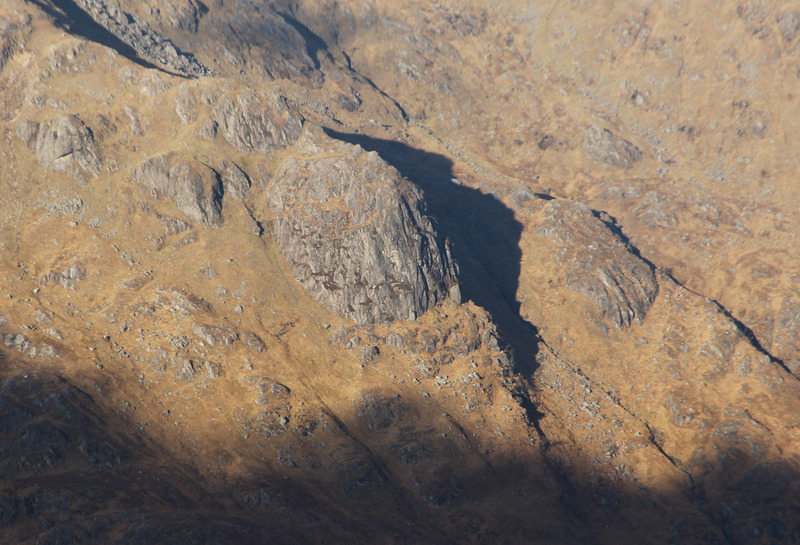 The slab just below the summit has a nice crack that I climbed. 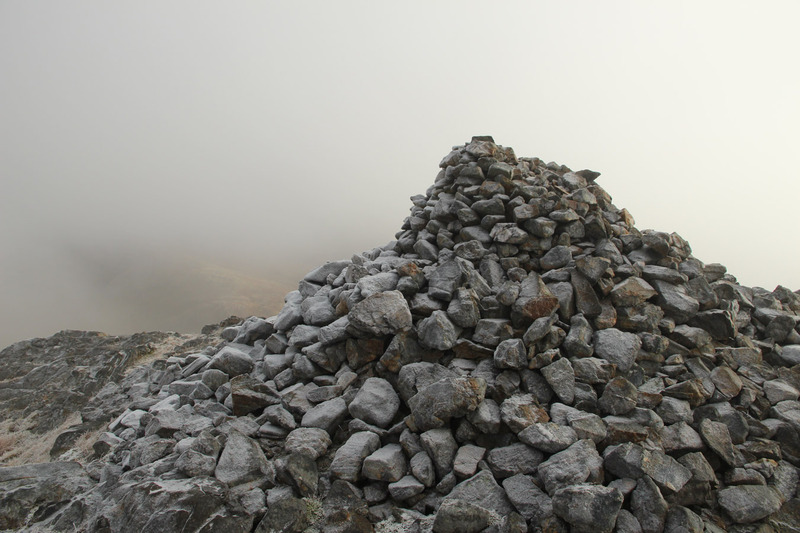 Again, the summit was misted in but the cairn is unmistakeable. It was midday and I was pleased with my time. 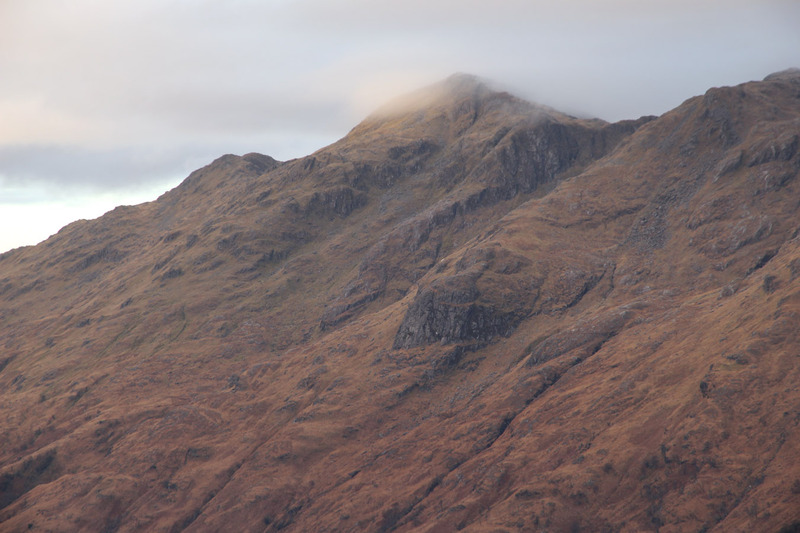 This was the time to commit to Corbett #3, Druim Tarsuinn, but there was no question of it. I set off south. 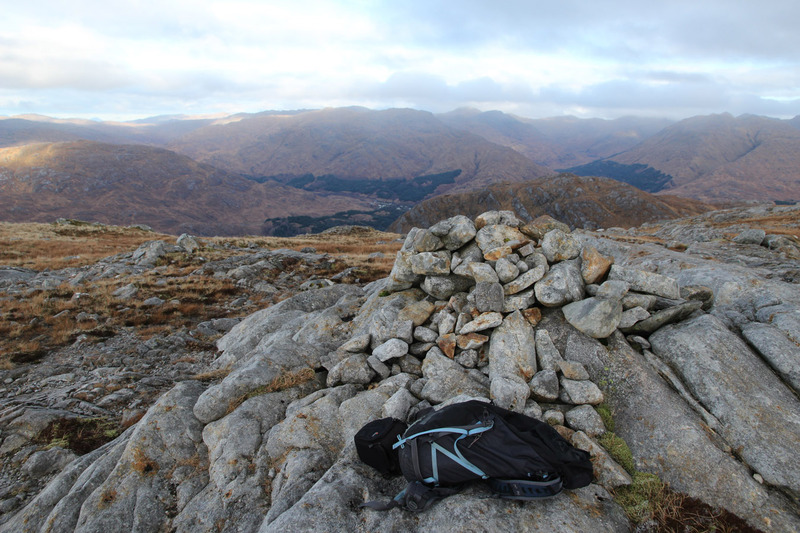 I stopped by Meall nan Creag Leac which is in an awesome exposed position over Loch Shiel. 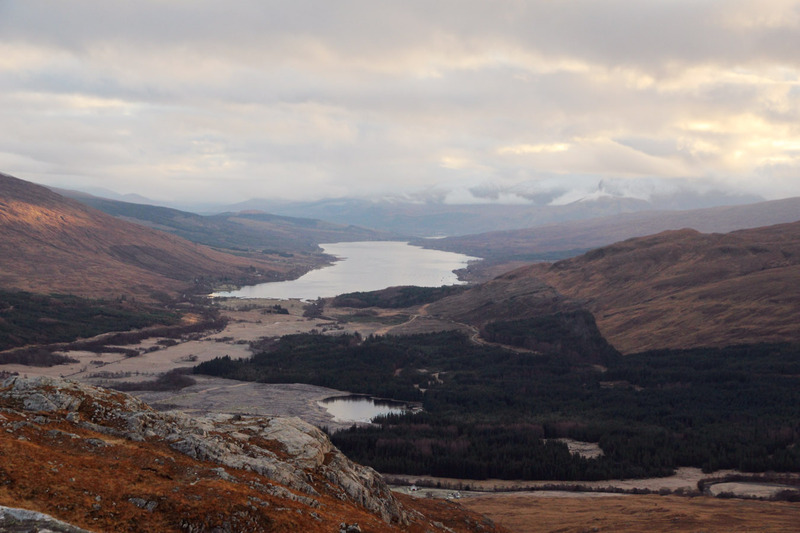 Once again, more photos here - the loch would now disappear from sight as I walked east. 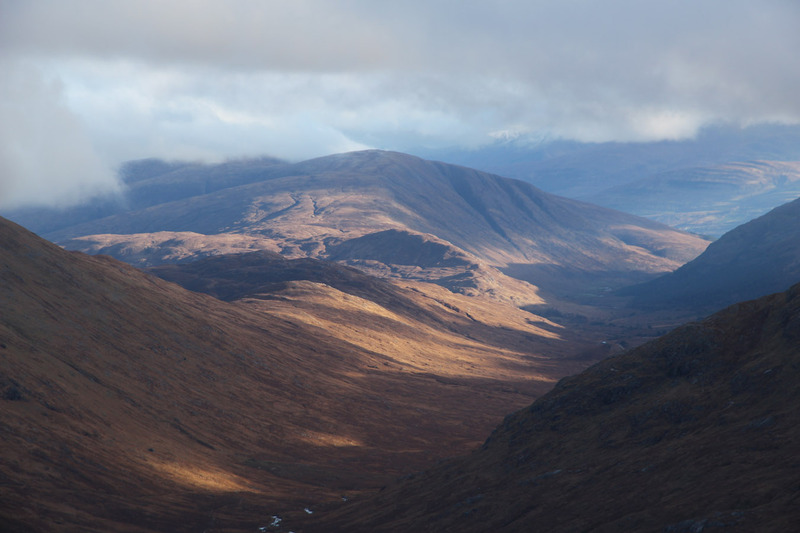 The ridges become meandering and ragged toward Druim Tarsuinn, a mountain with an 'outback' feel. It seems a long way from anywhere. 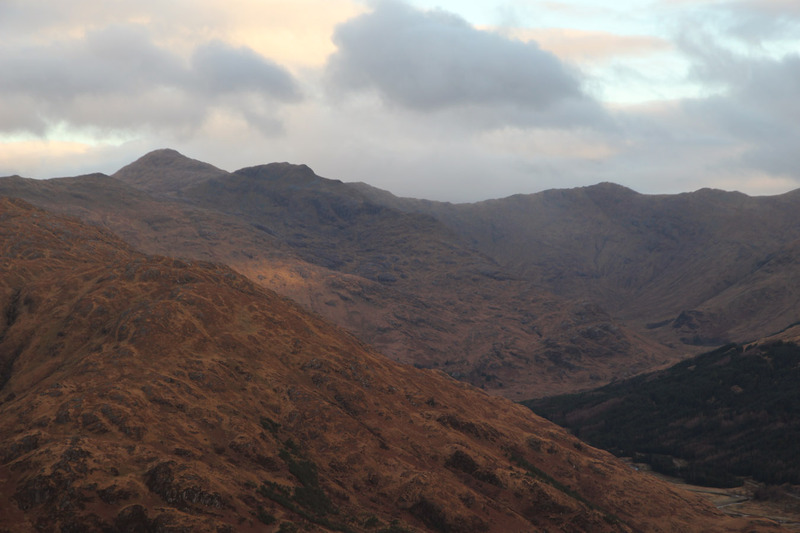 It would be some distance back to a road down the great Ardgour glens, and the hill is guarded from Glenfinnan by the mountains I'd just crossed. 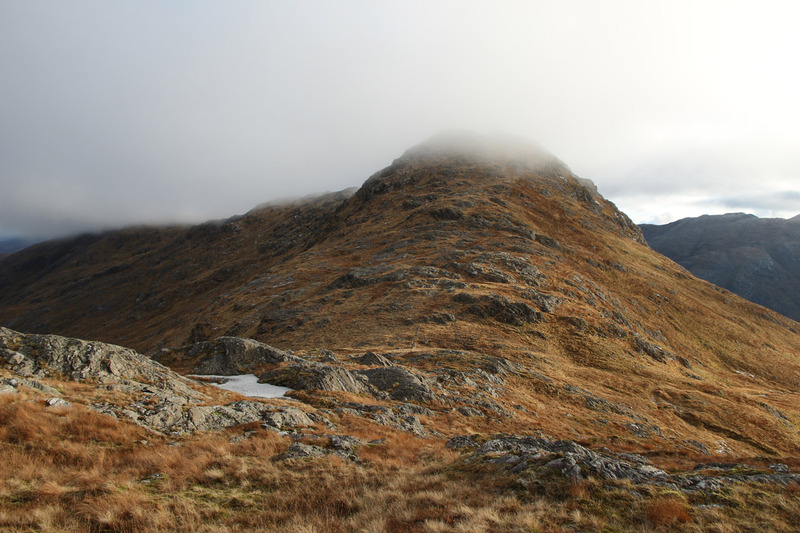 In character, it is a rugged, rocky ridge, but strangely feels just a high-point of this ridge rather than a self-standing mountain. That's a subtle distinction! 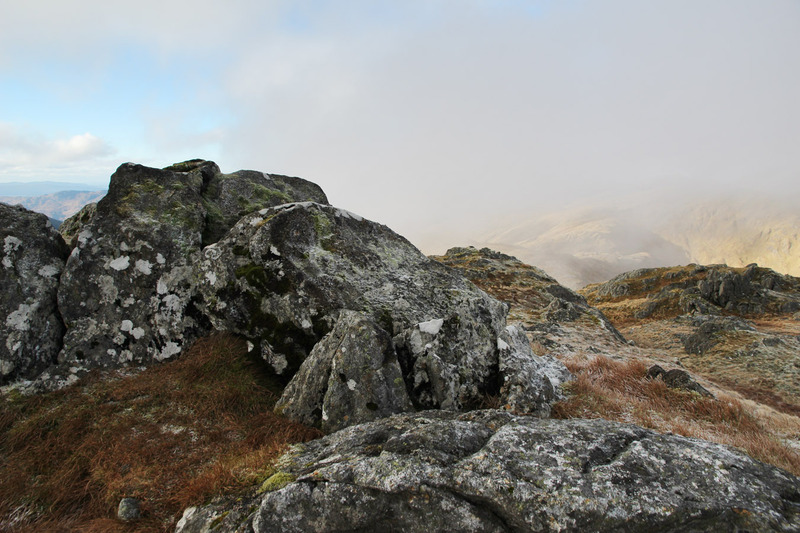 Another plod brought me to the top: I wasn't moving massively quickly but I noticed that I was consistent, my food intake steady and disciplined. My energy wasn't fluctuating. 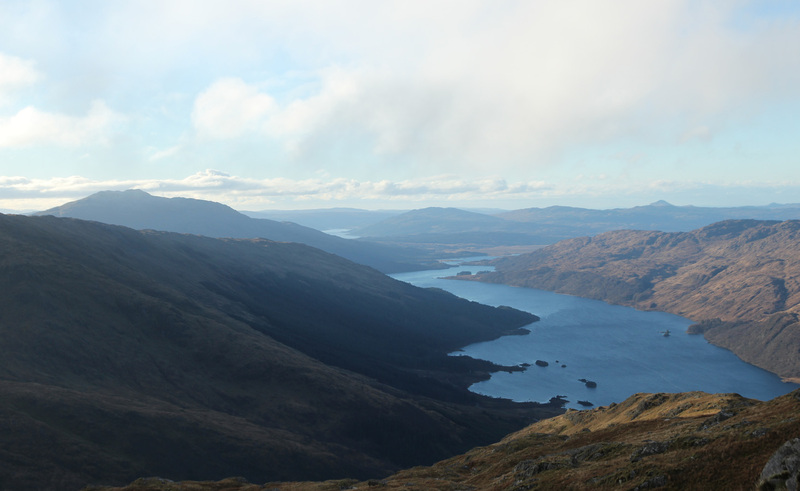 The sun was out on Druim Tarsuinn. 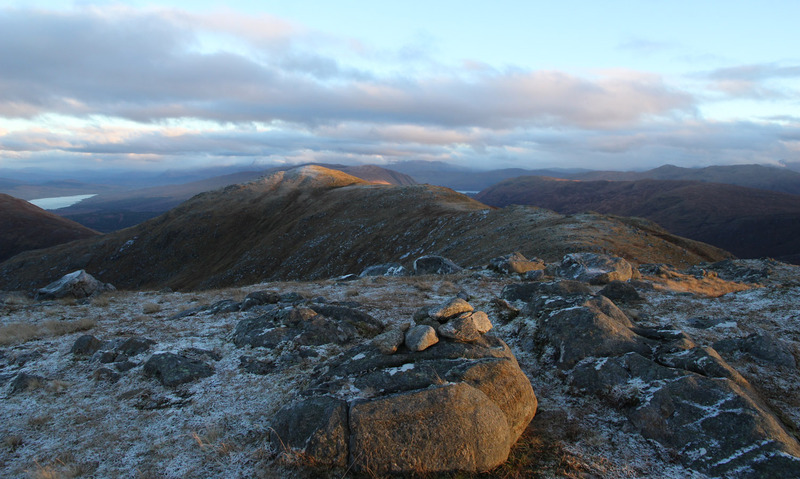 Ahead, Meall Mor, which seemed like an easy formality en route to the bigger event. 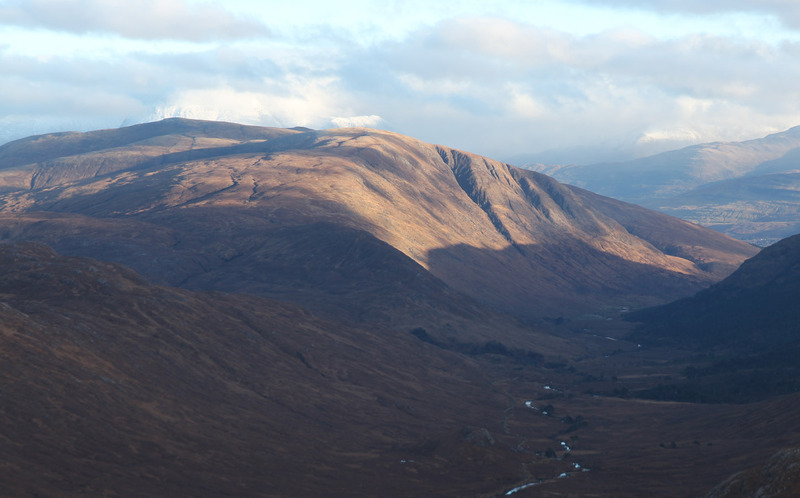 That would be descending into, then crossing, Cona Glen. 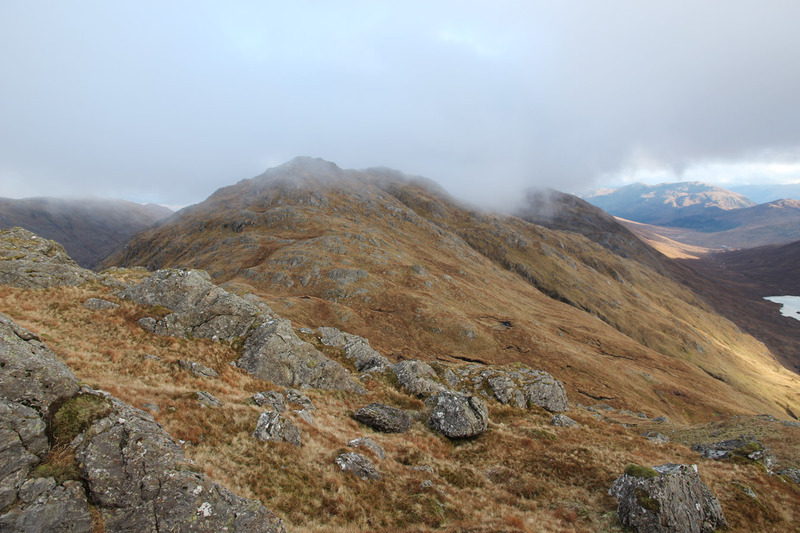 I went through mist over the summit, dropped steeply into the glen and crossed the river. 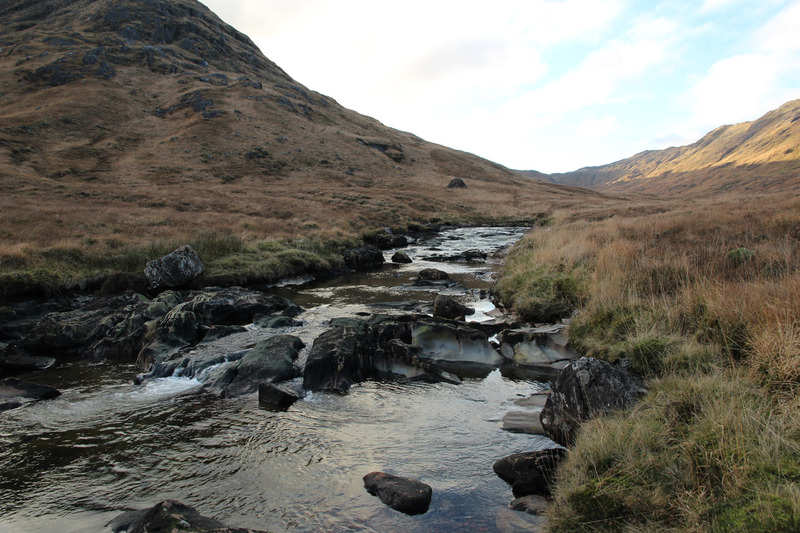 River crossings always look far bigger from above, but it was just a hop across some stones today. I was in no doubt, too, that I'd finish my day over the pair of Grahams to the north-east. 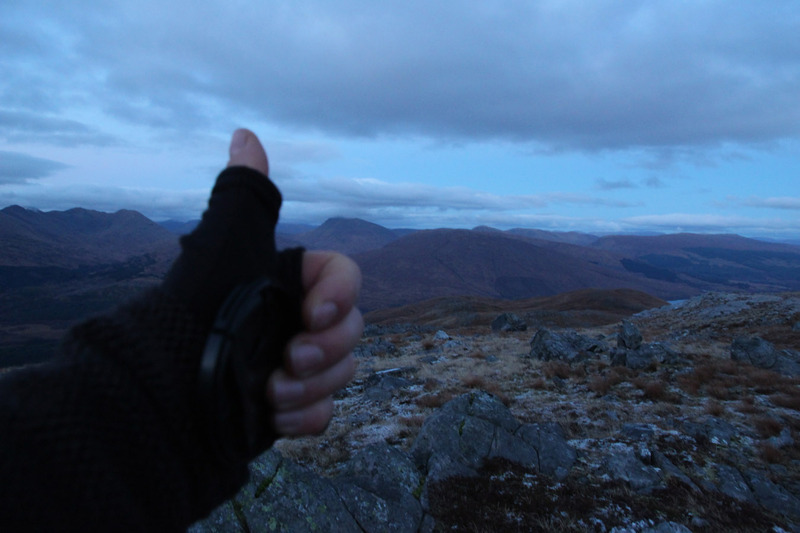 This would make a great end to the day, and a complete day that crossed every summit I'd have hoped. Given my rough morning, I was feeling in great shape; wonderful to feel the feet move like this again. The previous few days obviously counted for something. 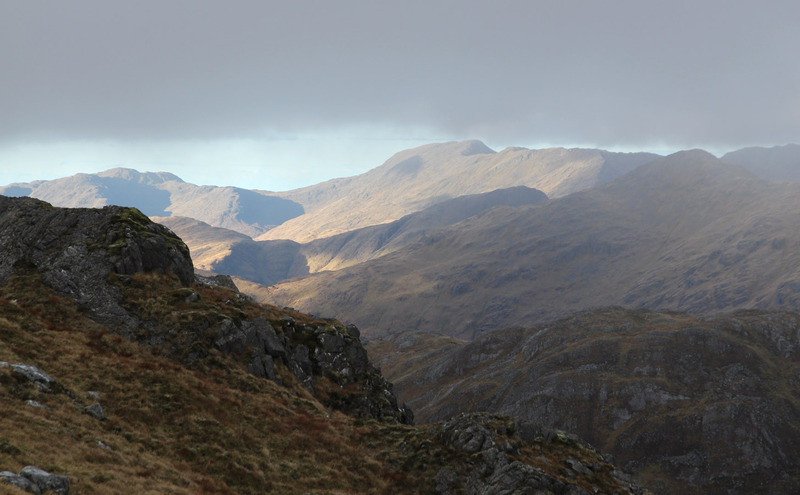 It counts so much to be in among the mountains, especially doing days back to back. The momentum of one carries you through to the next, and so on. 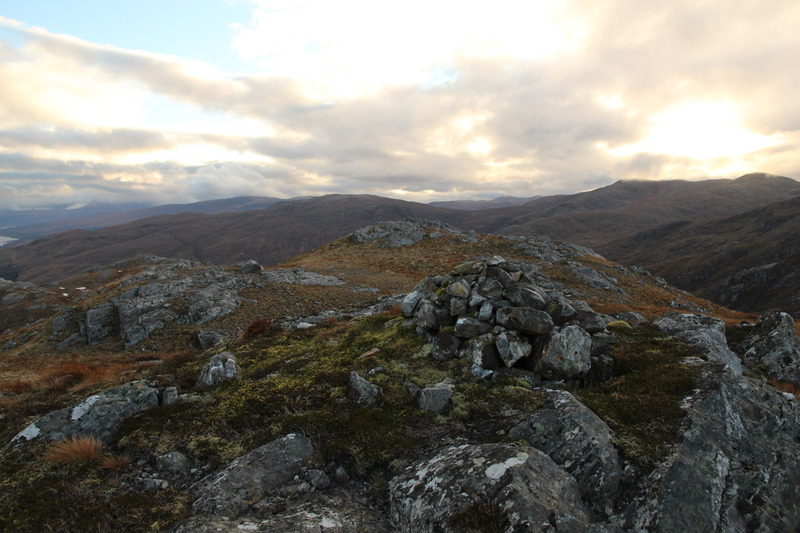 The first of the two Grahams was Meall nan Damh, and as I headed up the hills turned to evening colour - just after lunchtime, of course. Higher up I walked back into direct sunlight and arrived at the west top, which is just one metre lower than the main summit. Then the sun slid away and I found that while I was feeling well, I was also tiring. My back was getting sore too, something that seems to happen quite a lot. In time, the feet would start to hurt, and there was a hint of stomach upset. But that's fine, it's been a while since I did a day of this size, after all...? The afternoon had turned to gloom. 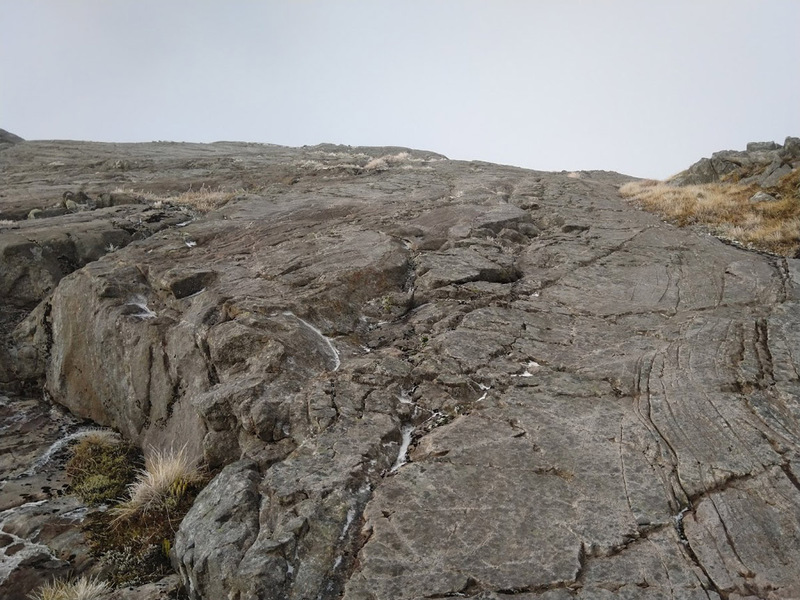 I stopped by the summit of Meall nan Damh for a pano then set off onto the last hill, Glas Bheinn, only just a Graham in both height and prominence! 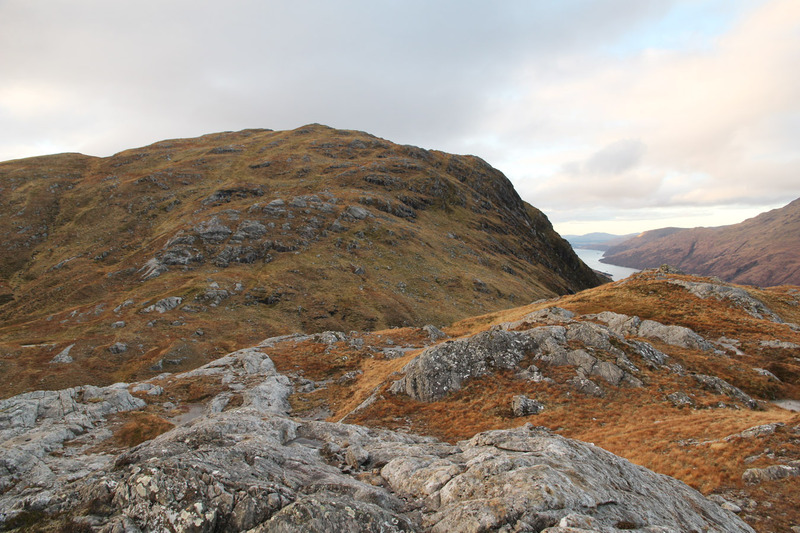 The long slope leading up is wind eroded, so the walking is easy. Just be patient. 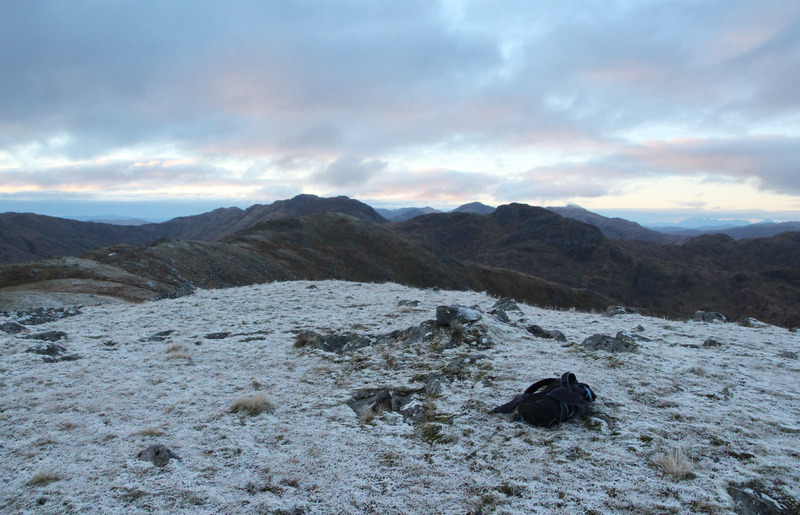 And in a half-light I reached the top, too focused on getting down even to entertain going over to the trig point. I went west down grass and occasional rock. Lower, the angle eased making bashing through the grass very enjoyable. Cross by the dam, onto the track, I went into the forest, but the track was in a right state and I'm perhaps glad I couldn't see all the bog I was putting my feet into. I reached the main track, and didn't need a headtorch back to the car as the stars emerged one by one. The feet took a pounding on the hard track! 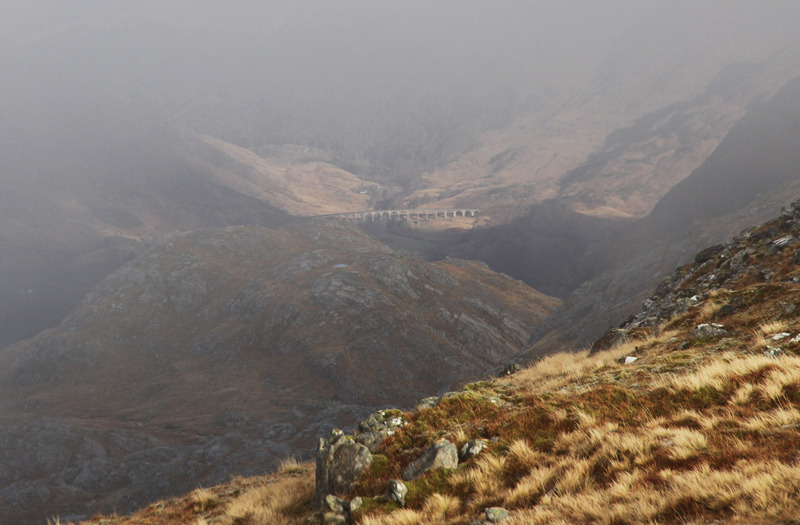 And I had an incredible contentedness at completing a route I've thought of for a long time. In spite of my tiredness, I've felt so full of energy and life this evening. Amazing how I can walk nearly 9 hours and feel more energetic than before! I love walking. The body is buzzing, as though it was given just exactly what was wanted, and this is the reward. Boots off at the car, engine on, Steven Wilson on - his tunes were banging around my head all day, usually the epic bits to mirror an epic land! 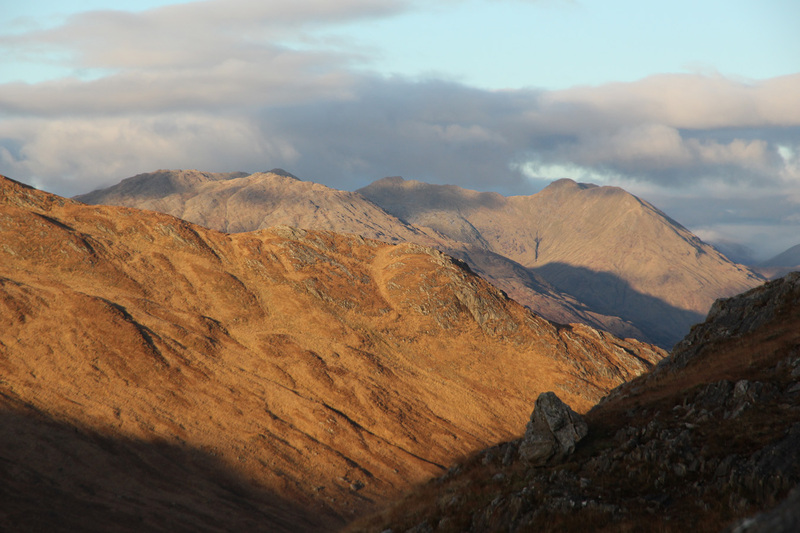 I feel I know this land so well, from the summer's trip across Beinn Odhar and Rois-bheinn, to Sgurr an Utha, the three Munros just north, Streap with Struan... I'm enjoying spending time here and I've almost climbed all the big hills. It's a great familiarity.